This proof is a total of three pages. Hopefully, you have already digested the First Page and the Second Page. This page is much simpler than the previous two. 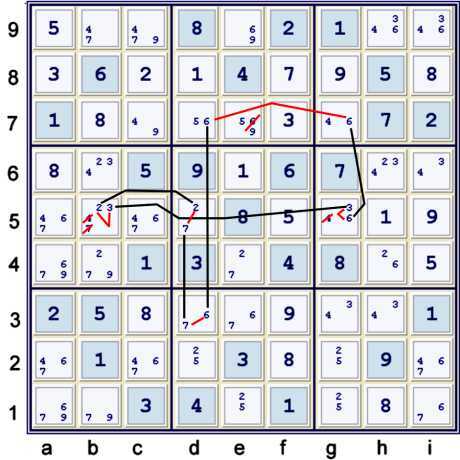 The puzzle can be solved from here without Advanced chains, however, I choose to use one such chain, illustrated variously, on this page. The naked pair 67 at de3 proves the eliminations shown above. All three representations below consider the exact same strong and weak inferences. All of them are found easily by searching for a very common Y Wing style centered upon c3,b7 both limited to candidates 48. Since this very common Y wing style does not exist, but one should look for it given the markers, finding the following chains is fairly routine. This last representation is a very good example of the power of appending simple chains derived from the concept of a pigeonhole matrix. If one was to write the pigeonhole matrix representation, then one would only need to append a bi-matrix in the result column. Clearly, in this case, the conclusion is not changed. Note that the chain piece:(4):b6=abc5-g5=1g3 can be viewed as a vertex in a very common Y wing style. 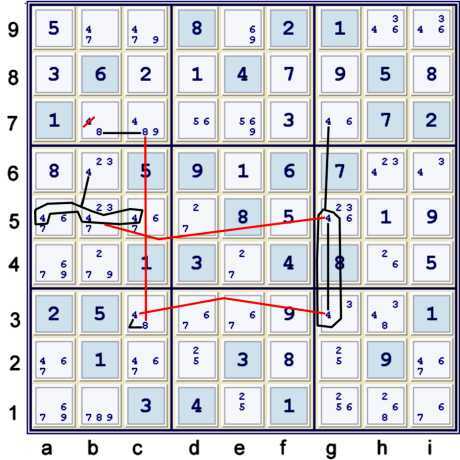 Thus, by searching for the very common Y wing style indicated by cells b7 and c3 both being limited to only 48, one can find this pattern quickly. Of course, one has to be aware of the fact that the appendage to the pattern, (4)g7 does not change the conclusion set at all. This truly demonstrates the power of using matrices to understand how to easily append simple chains. Learning how to do this well makes many complex eliminations much easier to find and to understand. I suppose the understanding should come first! 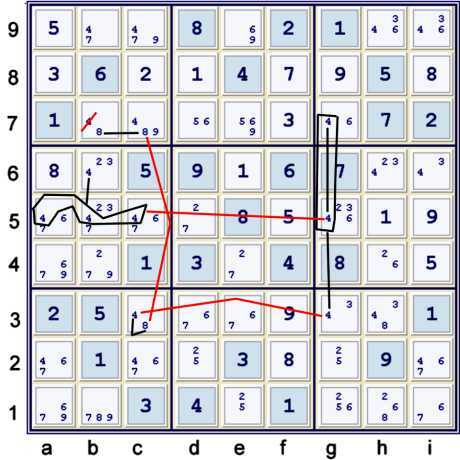 Regardless of which of these 4 patterns one might find, the puzzle is advanced identically: All the remaining 8s are solved. 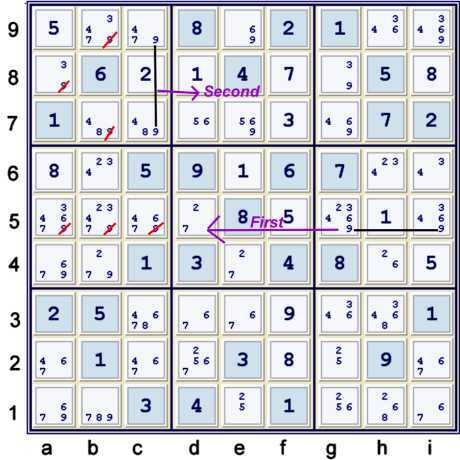 Above, the Hidden Pair 25 at g12 justifies the indicated eliminations. Above, (4)h6=i6 => b6≠4. 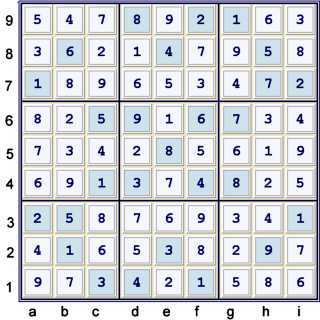 Then, b9 = 4 %column, and the puzzle is reduced to naked singles to the end. I hope that it is well understood that the concept of matrices can be a powerful tool in deriving what simple chain appendages look like. With that understanding, one can then more easily find the complex chains. 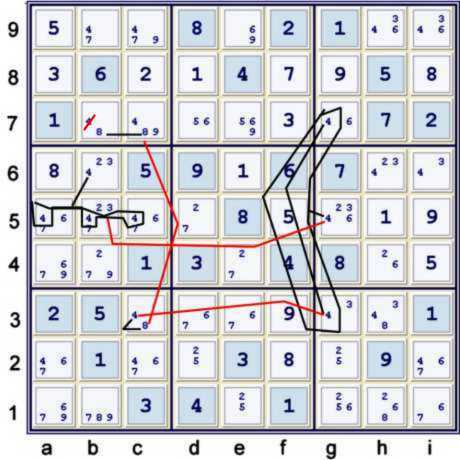 Once one can find the complex chains, many truly problematic puzzles are made much easier. I am not publishing ratings for a while, as I am thinking of overhauling my rating system. I would like to attempt to reflect the added complexity of steps that cannot be represented by a pigeonhole matrix. However, I have not come upon a satisfactory manner to do so. Suggestions are welcomed! Finally, I have chosen to take one step above and present it in 4 different ways. 3 of these ways use exactly the same strong inferences. It may be helpful to understand that complex chains can be represented in more than one way with chains. The matrix representation, however, would remain constant for each. The other representation uses some different strong inferences. It is often helpful to look for alternative means to prove the same elimination. Why? Because it teaches one that such alternatives almost always exist. Thus, the ability to find eliminations can be significantly enhanced, as there are many more possible ways to find them. 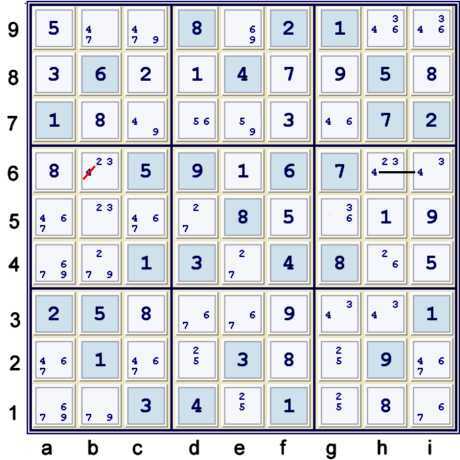 Looking for such alternative means towards a proven elimination is, in my opinion, a fantastic way to teach oneself how to tackle the truly difficult sudoku puzzles. What is a 'deadly rectangle'? I'm working the archives and trying to solve the tough for April 5, 2006. h5, i5, and h3 are possibly 27. i3 is possibly 279. A poster refers to this as a 'deadly rectangle' and concludes that i3 must be 9. Why?